Where heaven took a step on earth, when the flames were dancing in front of the metal gods, AZOOMA was born. 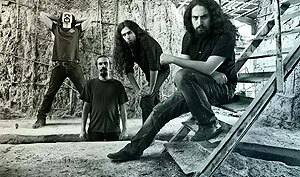 In May 2004, Iranian guitarist Ahmad Tokallou and bassist Farid Shariat decided to form a band with their interest in the Rock and Metal genres but in a new way, which was influenced by their own familiar Persian culture. Farid's brother, Saeed Shariat - drummer, joined them in July 2004, and completed the band, entitled AZOOMA. The band began practicing, covering songs from bands such as Death, Iced Earth, Iron Maiden, Metallica and Kreator, while developing their own sound. Soon after, they began to compose original songs which sent them to the underground metal scene of Mashhad, The Holy City. In 2005, AZOOMA played their first show in their home town and then they decided to focus more on the Progressive and Death Metal genres. This led them to invite vocalist and lyricist Shahin Vaqfipour to the band. They created their first demo in 2006 and worked on discovering their own style. In 2009, Ahmad and Saeed joined another Iranian death metal band temporarily because of Farid's service in the Army until spring 2012. They played several shows and festivals in countries such as India, Dubai and Armenia, but as Ahmad and Saeed couldn't see any future for themselves in that band, they left and built their own rehearsal room for AZOOMA. The band played as co-headliner act at the Persian Metal Fest 2013 and shared a stage with great metallers such as GOROD. 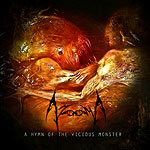 AZOOMA spend most of 2012 and 2013 writing and recording new material for the band's debut EP, "A Hymn of ohe Vicious Monster", which sounds heavy, brutal and fast. They mixed old school death metal elements with some Persian ones, which run through their veins, resulting in 6 heavy masterpiece tracks. 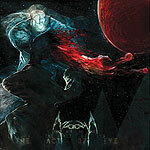 In 2014, AZOOMA contacted the Iranian heavy metal Journalist and Chief Editor of Metal Shock Finland, Mohsen Fayyazi, for help to reach a suitable record label for releasing this EP. Mohsen accepted their request and they inked a deal. AZOOMA signed a contract with Spanish record company Xtreem Music. Now, "A Hymn of the Vicious Monster" has been released worldwide on June 15th through Xtreem Music. If you run a zine, webzine or you need high quality graphic stuff about the band, you can download here a .ZIP file with: Pictures, Logos and Album cover.